My gals don't come out very often unless they're all hooched up with a ton of funny money, a nip of the hard stuff and a vintage surprise, but here are some of my lovelies just looking for the right person to snap them up. Even without their naughty-but-nice wrappings, my beauties are anything but Plain Janes. 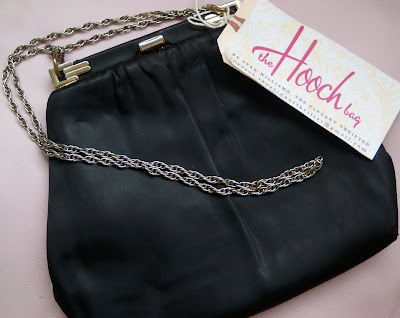 Now this satin bag from the 1960s has been going by the name of Jackie. She'll change it in a flash since her identity is difficult to verify. 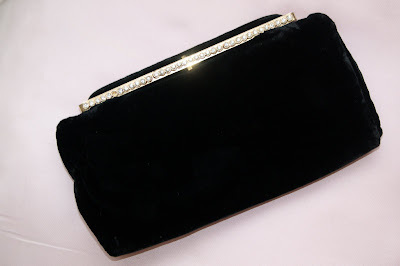 This glamorous, 1950s velvet clutch by Garay is is chic and demure....but once she hits the town all bets are off. This vintage velvet MM clutch from the 40s is understated...until you fill her deep pockets with a bunch of hooch and a ton of funny money. Oh she's a looker, but we can't tell how old she is. Is it the lift or the lack of identity? Ain't she a dame? This 1960s beaded lady will turn some heads. You've had a special preview of my Hooch Bags without all their trimmings. If you'd like one of these black beauties all hooched up just for you or for someone special, email me at theelegantthrifter@gmail.com. And be sure to visit The Elegant Thrifter.